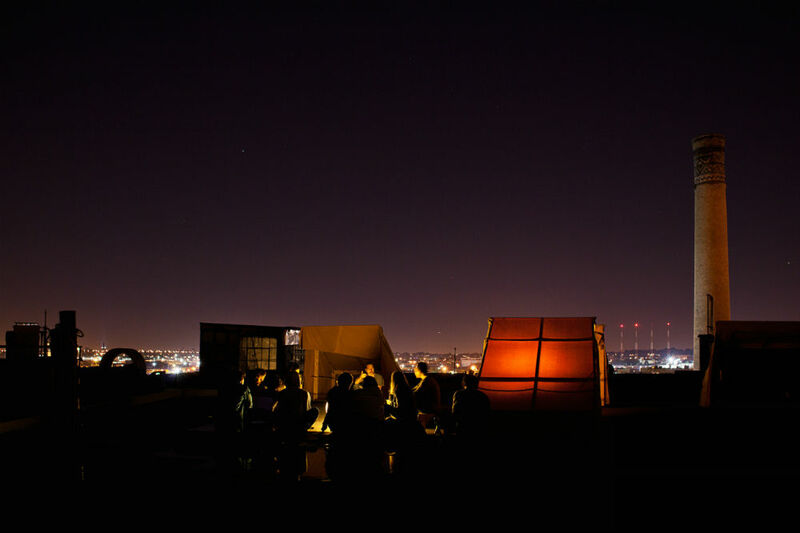 Urban camping on the roof of a high-rise building? The Bivouac Project is a burgeoning movement working to motivate city-dwellers to unplug and sleep under the stars. Imagine being unplugged, no electronics, cooking by fire, sleeping in a tent with only your fellow campers to keep you company. Oh, and it’s in the heart of New York City. The four-year-old Bivouac Project enters its final season this month before relocating for a new urban-outback experience. 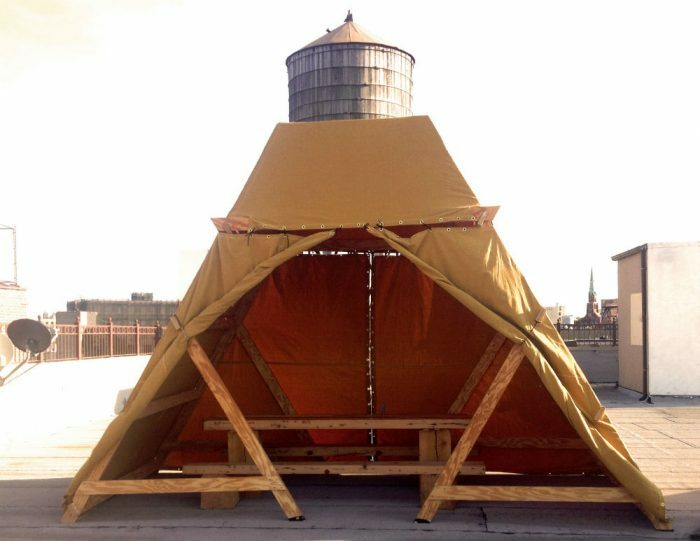 Brought to life by artist Thomas Stevenson in 2011, Bivouac puts a small group of strangers together for a single night of camping high upon the rooftop of a New York City building. For Stevenson, the self-appointed “camp counselor and park ranger,” it’s not much. A homemade tarp shelter, some cooking utensils and fire, and a community of people – many of them strangers. No electronics, no internet, no shower (there’s a toilet inside the building). But Stevenson is an artist first and camp counselor (a close) second. It’s time for a new project. Something and somewhere else. Stevenson said he’s had interest from some venues in the Midwest, including GearJunkie’s Minneapolis home. The concept is a concentric yurt within a yurt within a yurt (think Russian dolls) that hosts guests for short stays. “The idea is to have social areas and living rooms in the outermost yert, then dining and bathing in the middle, and sleeping quarters in the center,’ he said. The purpose, he told us, is to explore the boundaries between our social and personal selves. 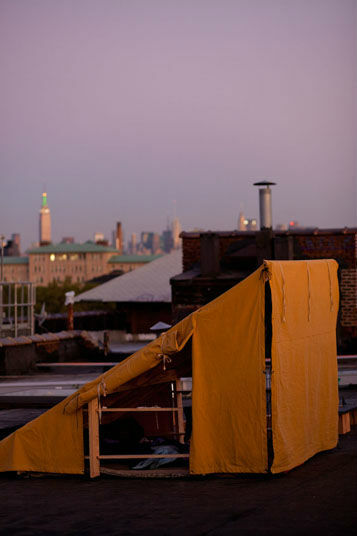 In case you won’t be in New York City in time for the final week of urban camping, don’t fear! As part of his original vision, Stevenson has plans and resources available for anyone that wanted to replicate or scale the concept in their own town. If you’re following his model, that means six handmade two-person shelters and enough coffee for 18 people the morning after. His model welcomed guests for 15-18 hours at a time, from sunset to mid-morning, before cleaning and cycling in a fresh crop of campers. All he asked campers to bring was at least one item of food to share, a sleeping bag, pad, blankets, and pillow. Electronics were strictly prohibited. Stevenson charged nothing for his hospitality, though it required significant investment of his own. Aside from the cost to build the shelters, he paid for any costs associated with finding a site. Still, he noted, it has been worth it. If you’re interested in starting your own Bivouac community or learning about the upcoming Quarters project, contact Thomas Stevenson.